The anguid lizards range across all continents except Australia and show their greatest diversity in the Americas. Many of the species are limbless as this Scheltopusik (a Slavic word meaning “yellow belly”). This is an enormous lizard with large specimens reaching almost 5 feet in length and more than 2 inches in diameter. Only wart-like remnants of the hind limbs are evident and no forelimbs remain. These large lizards seem to feed preferably on land snails which they crush and eat, shell remnants and all. Lacking limbs, they clean the face by wiping the sides of the head against the ground. Recent feeding studies in agricultural areas of southern Russia suggest that these lizards are a very important factor in the biological control of insect pests. Apparently they preferably feed on corn beetles. The Scheltopusik ranges from the Balkans to central Asia. 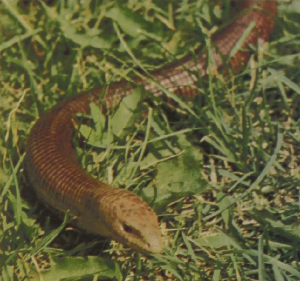 Specimens have lived for 20 years, in a terrarium, but the related European Slow-worm is supposed to have lived more than 35 years in captivity.